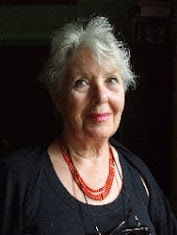 I am so saddened to learn about the tragic passing of our lovely and talented photo-blogging buddy, Tina Forrester who blogged over at East Gwillimbury CameraGirl. She and her husband, Tom were taken in a traffic accident a few days ago. My heart goes out to their family and friends. This one is for you, Tina. One day, last winter, I had a craving for some French onion soup. Banish the onion from the kitchen and the pleasure flies with it. Its presence lends color and enchantment to the most modest dish; its absence reduces the rarest delicacy to hopeless insipidity, and dinner to despair. I had never made it before and went in search of a recipe. I decided on this one. 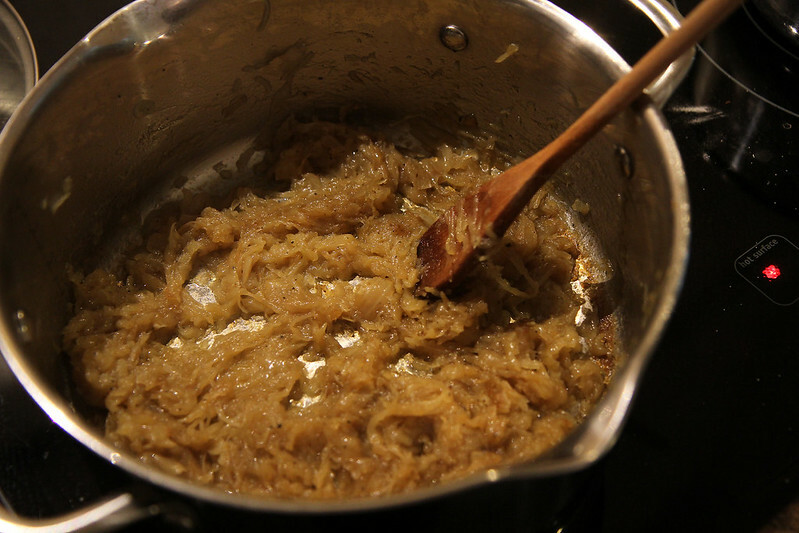 It was more time consuming than I'd imagined, allowing the onions to caramelize but it was also incredibly yummy. This is what six or seven large onions simmered down to. 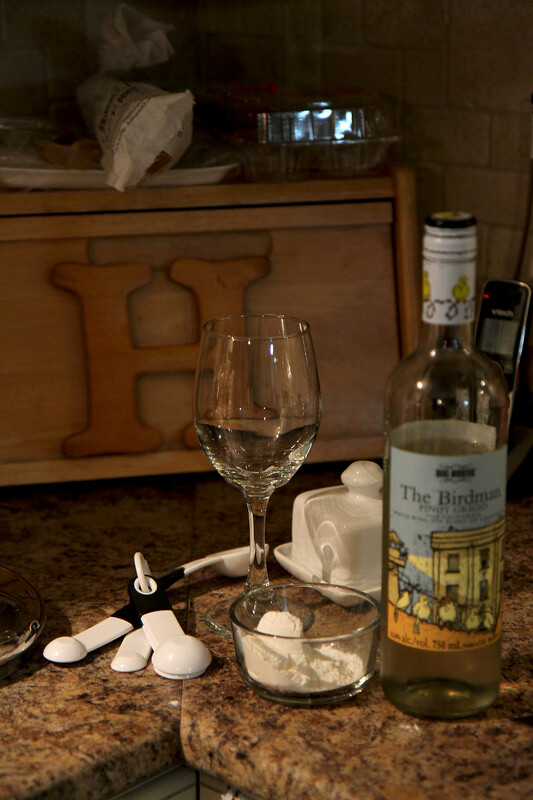 The recipe states that wine is optional. Ha! I wouldn't possibly consider opting out of adding this flavour enhancer. And given the choice between Gruyere and Parmesan cheese, I went for the former. I probably even added a bit of the latter. Unfortunately, there were no photos take of the finished product. It disappeared far too quickly. Plus I forgot. Mostly, I forgot (I did mention the wine, right?). But it was delicious. I strongly recommend this recipe. If you happen to make it, please let me know how you like it. 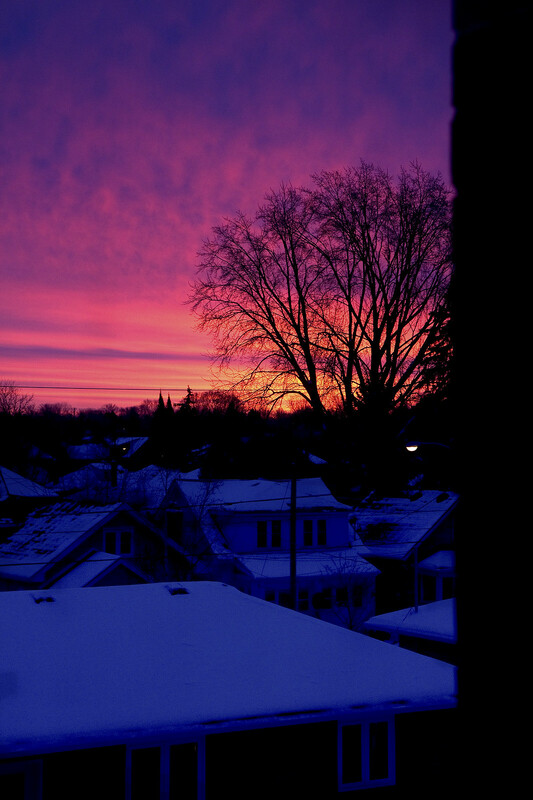 A winter sunrise possesses so many vibrant, jewel-tone colours. This was the view outside my apartment window, a few mornings back. We've had some crazy weather, this winter. We keep jumping from above-seasonal highs to deep freezes, only to warm up a day or two later with rain, freezing rain or a large dump of snow. 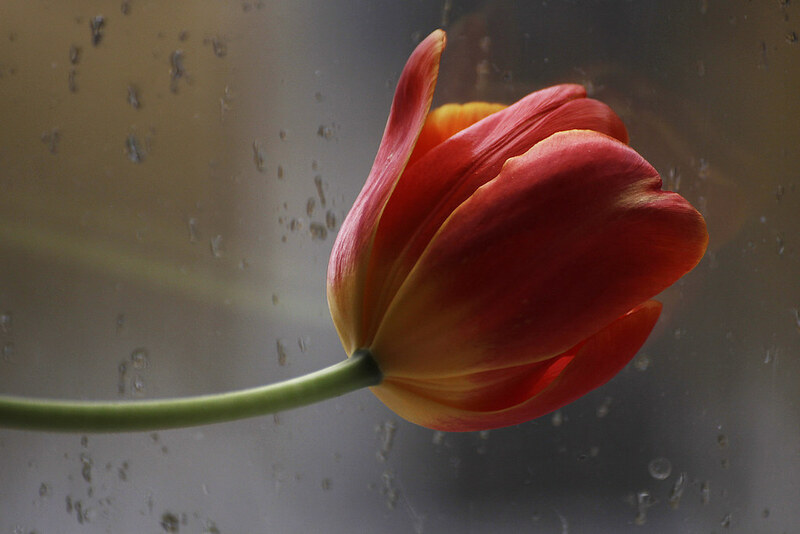 Someone (probably my sister) on Facebook suggested that Mother Nature might be menopausal. That sounded about right. As I type, we are experiencing freezing rain which weather-watchers predict will turn to rain as the temperatures rise to just above freezing over the next few hours. 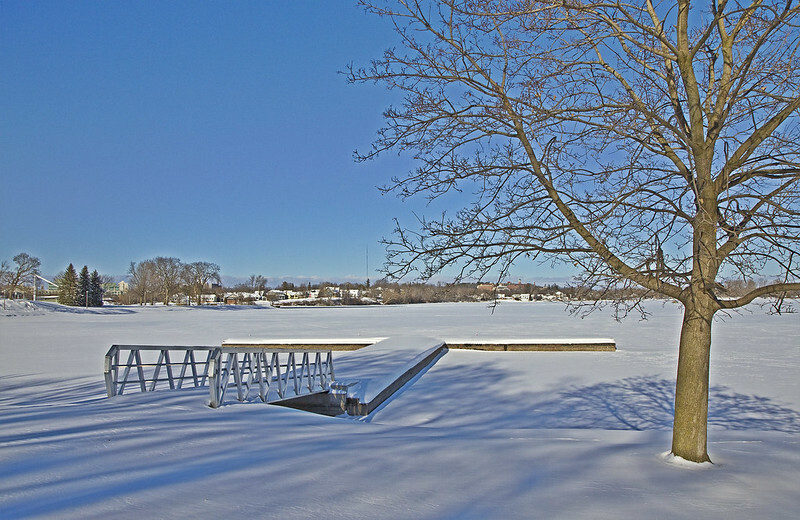 This image of the eastward-facing view across Little Lake was taken last week, after a snowfall and before the melt. The water tower you see straight ahead belongs to Quaker Oats/PepsiCo. This factory has been in Peterborough since 1902 but was rebuilt after a devastating fire destroyed it in 1916. When the wind is blowing just right (or just wrong), you can smell the sickeningly-sweet smell of their flavoured oatmeal wafting through the east end of the city. At first the scent is pleasant - like fresh baking but eventually it can permeate the air quite relentlessly, forcing you to find something with which you can overpower it. Like wine. It was a brilliant, sunny day but very windy and much too cold to just sit for a while. The windchill was around -24C (-11F). I played around with the colour/effect in this and the next image in Photoshop a bit. 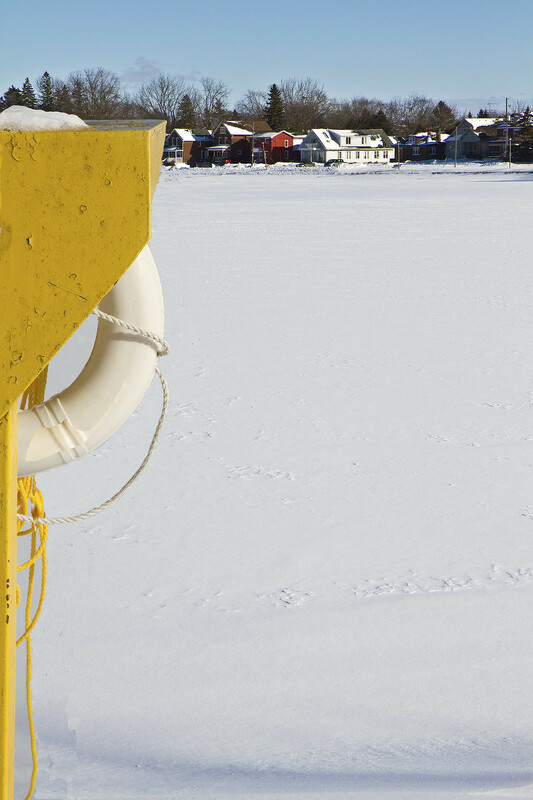 You can see by the absence of footprints that nobody had interest in stepping out on the dock. 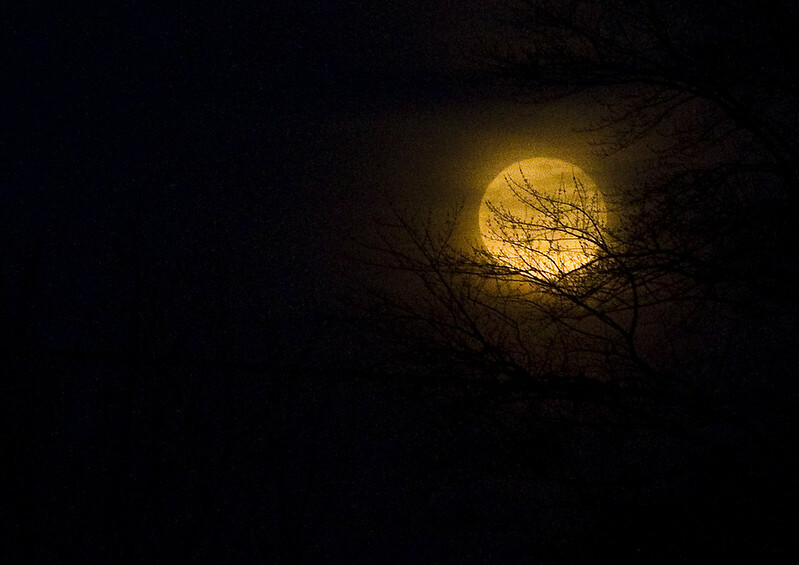 A couple of evenings ago, we had a full moon. This image was taken shortly after it rose. Unfortunately, it was snapped through two panes of less-than-sparkling-clean glass, one window screen and the branches of a tree a city block away. Still, it demanded I take its picture. Bossy old moon! More photos coming up.. eventually. 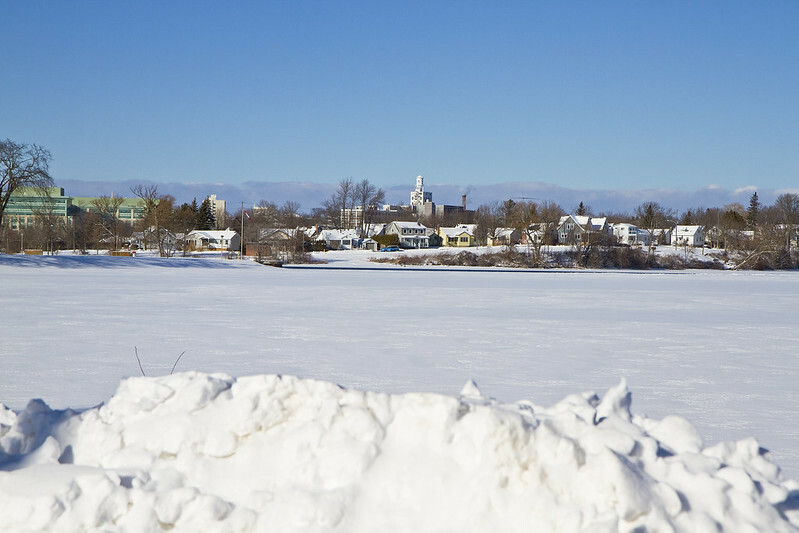 Winter's icy fingers have gripped southern Ontario by the snowballs rather suddenly and aggressively the past couple of days. Up until this week, the weather hasn't strayed too far below the freezing mark for very long, and many daytime highs have climbed well above seasonal norms. 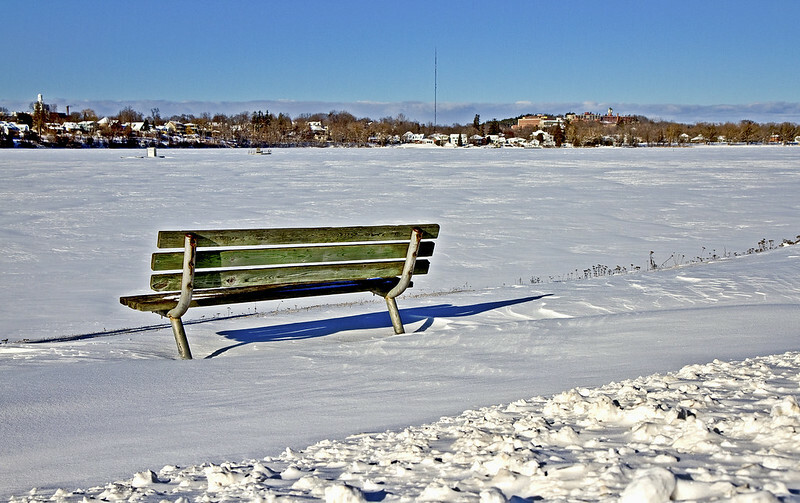 That came to an abrupt end on Friday when temperatures dropped from a near-balmy -5C (23F) to a painfully cold windchill factor of -40C (which is also -40F) expected for tonight. 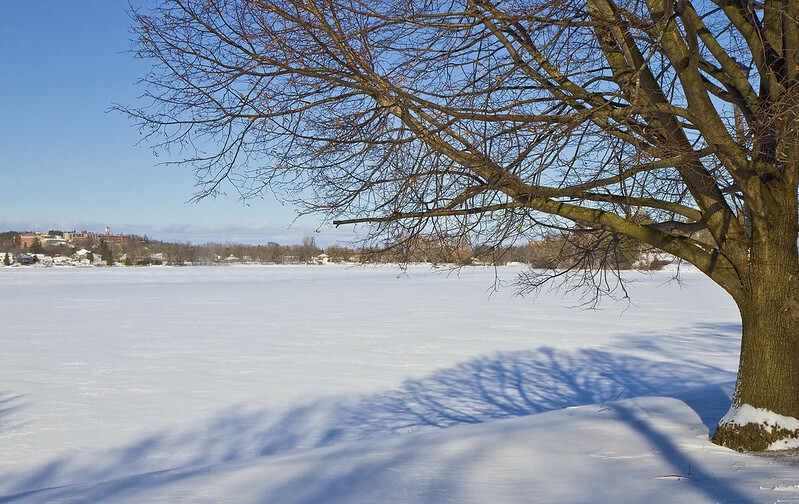 Hopefully, this blog post finds you toasty warm and in the mood for a few winter photos. 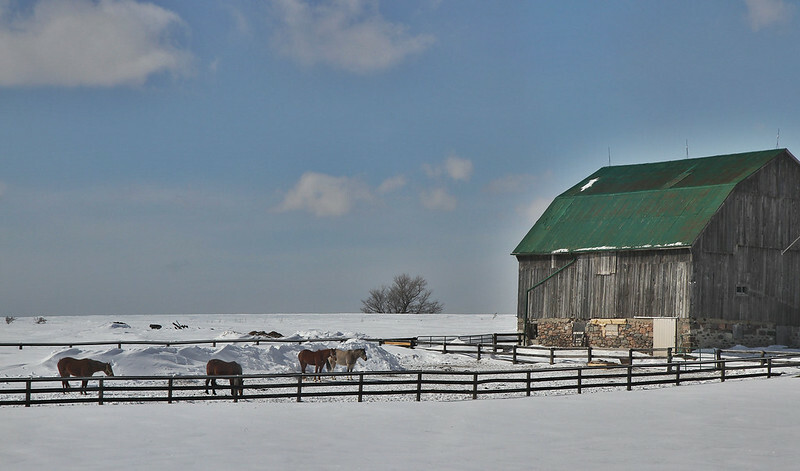 There are no shortages of barns, once you get north of Peterborough. This one was snapped from the car last year when my son and I were headed south to our old haunts. We've had much less snow than that. this year. 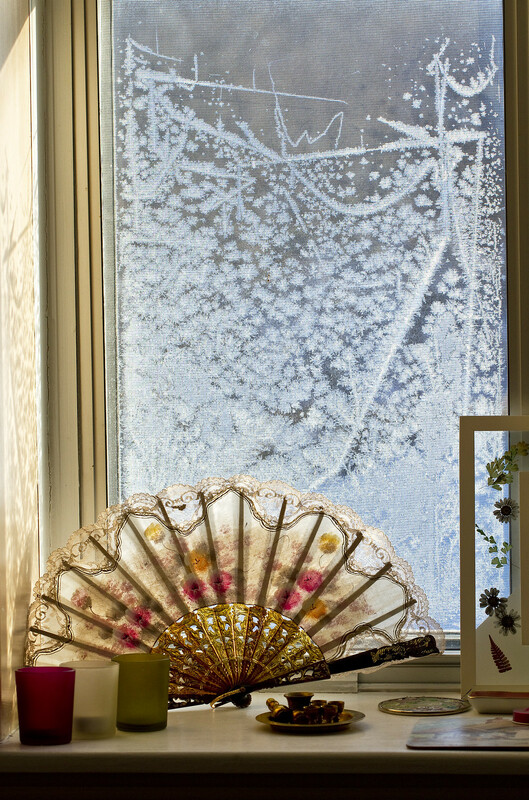 Frost on my window catches the morning sun, rising to greet the town. Another one from last year. 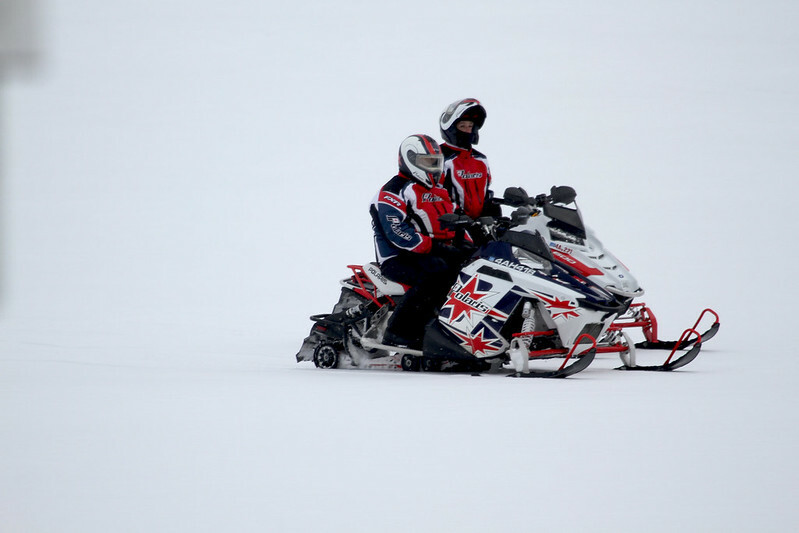 As soon as the lake was frozen, snowmobiles zipped by semi-regularly. 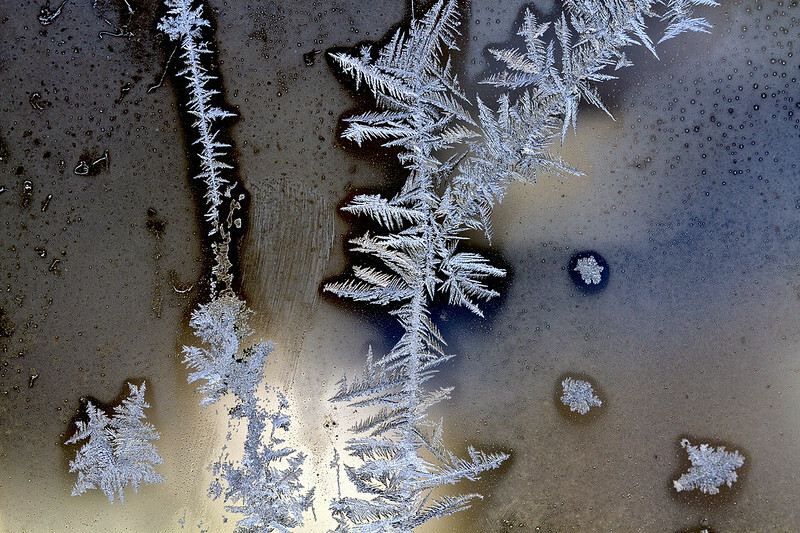 A recent frosty window. I played with the exposure settings a bit for this one. See how that one little cloud floats like a pink feather from some gigantic flamingo. … How small we feel with our petty ambitions and strivings in the presence of the great elemental forces of Nature! This was captured back in April of last year. 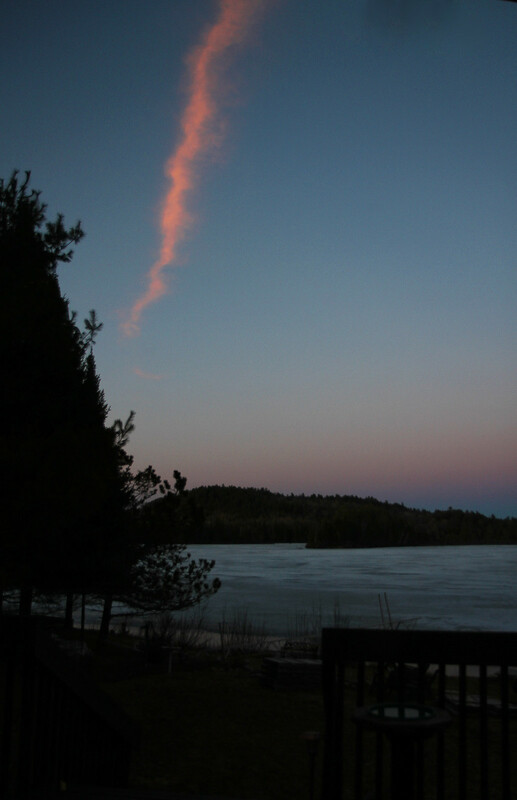 The lake outside my door was still frozen but that didn't deter the dusk from accessorizing the sky with a cheerful, springlike pink feather. 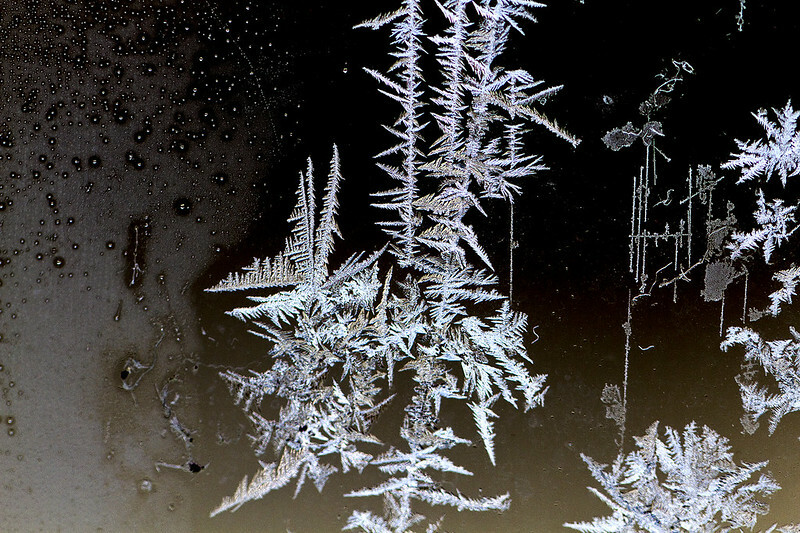 You had to know that with me, if there's one frosty windowpane image, there's going to be several. This kind of looks like a night sky behind it but it was taken mid-afternoon. During the long, cold months of winter, we often have a tendency to turn toward comfort foods. In December, I had the honour of being included among a wonderful group of women friends for the making of Christmas pierogies. 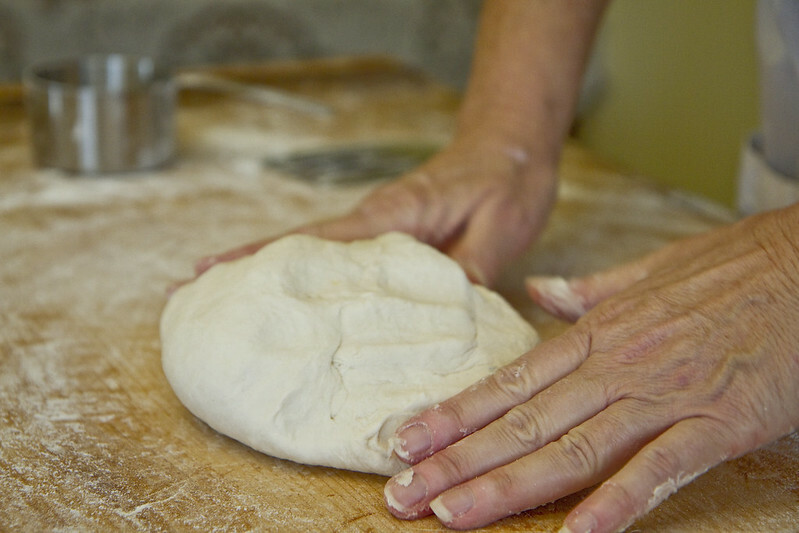 Experienced hands readied the dough on a breadboard which has seen a few generations of food preparation. She rolled up and down, back and forth. 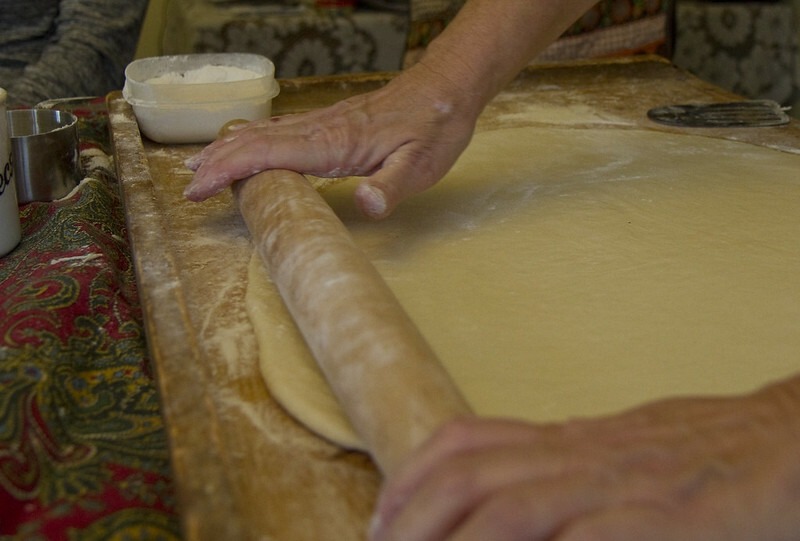 and the dough stretched and gave. Each ball of dough yielded quite a bit of rolled out real estate. 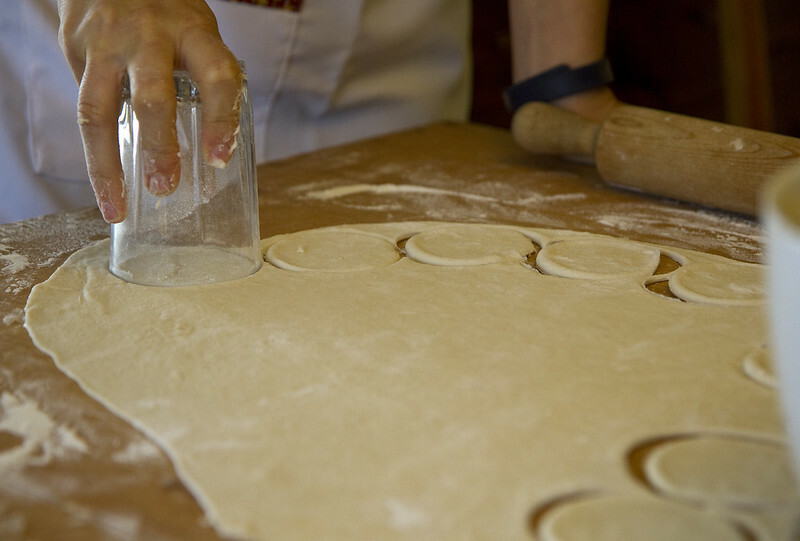 We used a simple glass to cut the circles from the dough. 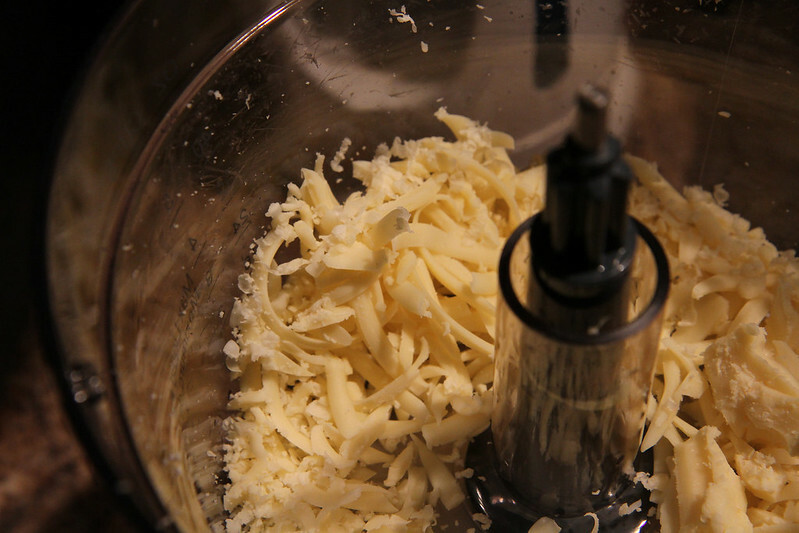 The potato and cheese mixture was ready and waiting for helpers to grab those spoons to start filling these scrumptious treats. 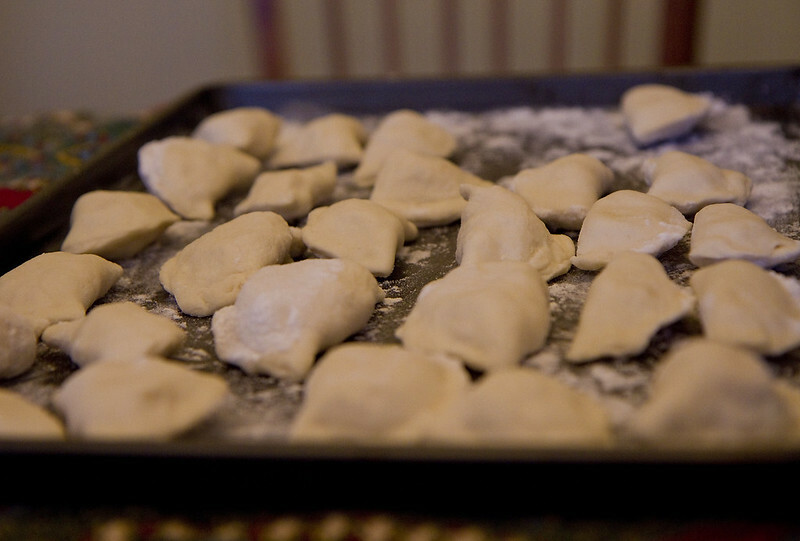 noun, plural pierogi, pierogies. Eastern European Cookery. 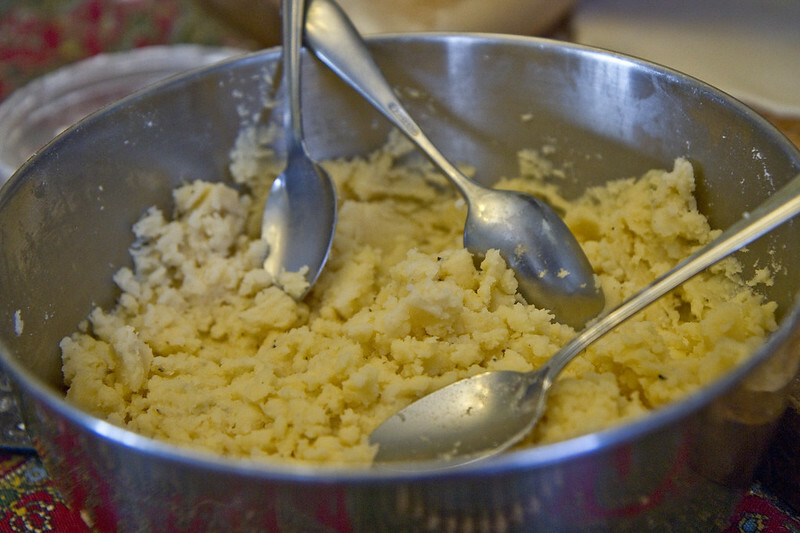 1. a small dough envelope filled with mashed potato, meat, cheese, or vegetables, crimped to seal the edge and then boiled or fried, typically served with sour cream or onions. And fill them, we did – several dozens of them. There were also some previously-made pierogies which we had as part of our lunch. All in all a lovely day with lovely people. 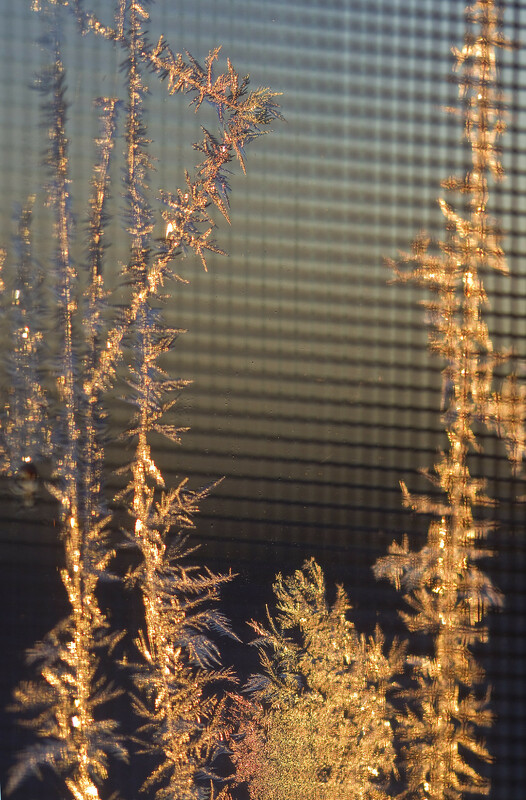 I'll leave you with one final frosty window shot from this very morning (Saturday). As some of you have noticed before (hi, AC! ), I tend to develop a theme around a small collection of photos, from time to time. This is one of those times, and the theme is texture. 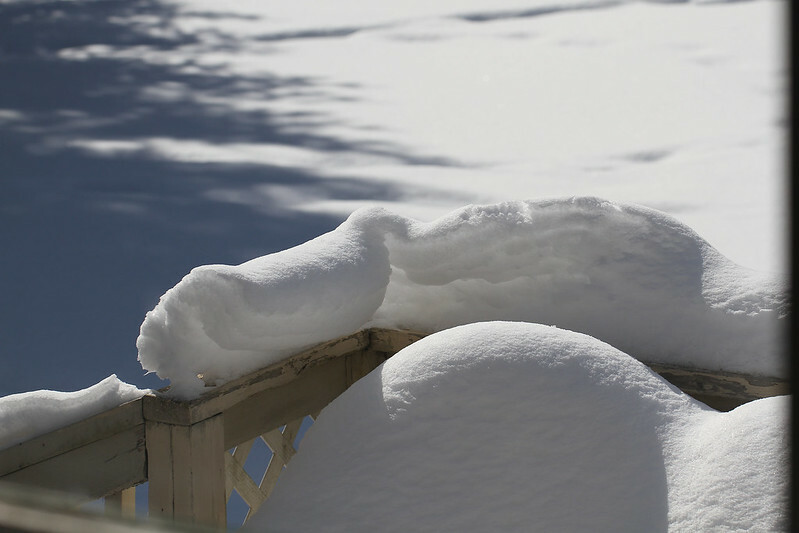 After as snowstorm, when all was said and done, layers of snow combined with wind created this frilly effect. 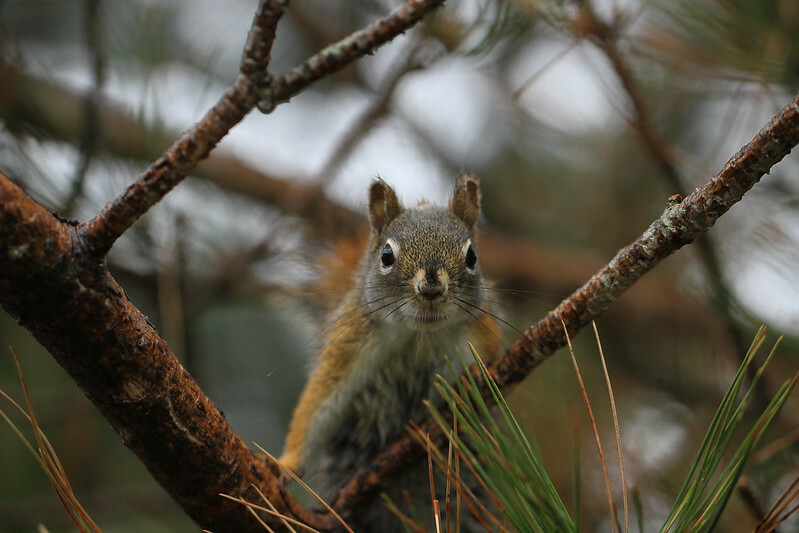 Rough branches, prickly needles and the soft little stubble of a red squirrel's moustache and whiskers. And speaking of stubble, this contemplative beard-laden face belongs to my younger son. 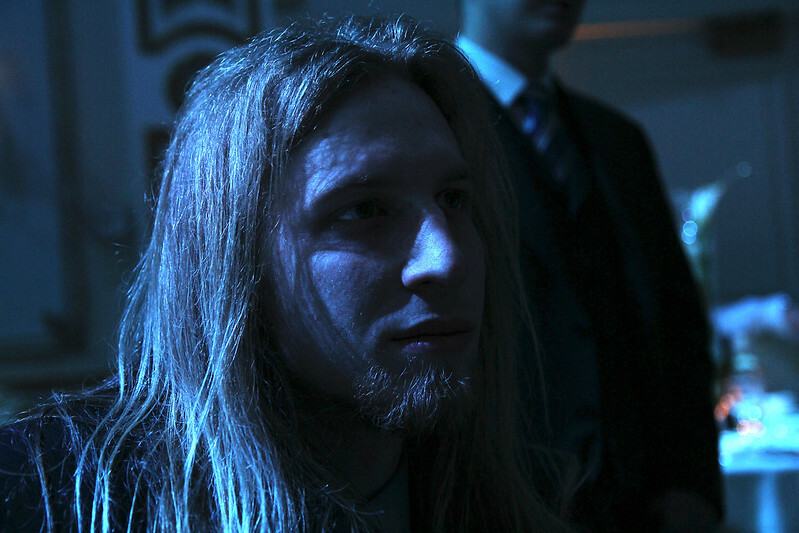 We were at a family wedding where the lighting was blueish. At that particular moment, perhaps the music was too. 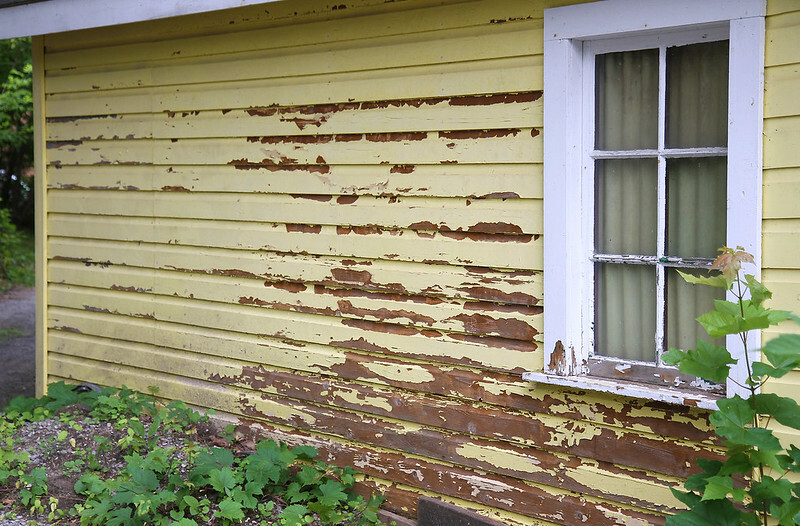 I suppose it would take a fair bit of work to get this place in shape again. This beauty is Marzy. 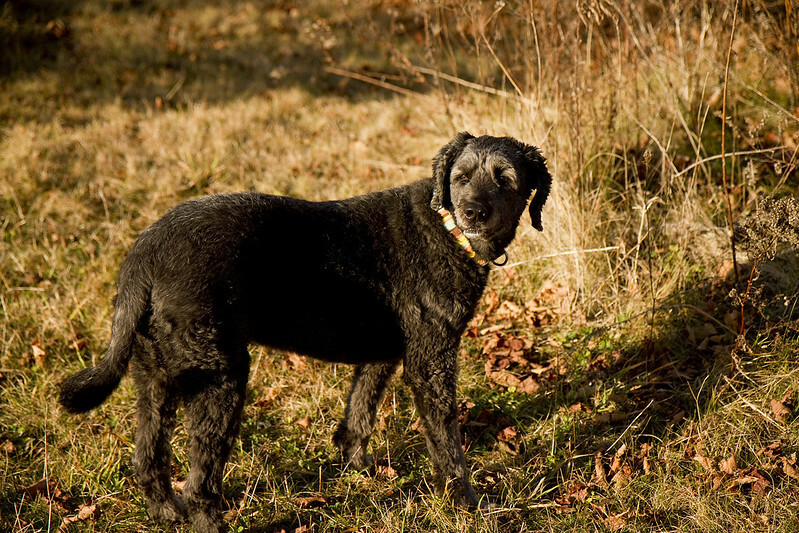 I met her while visiting friends a short while before Christmas. 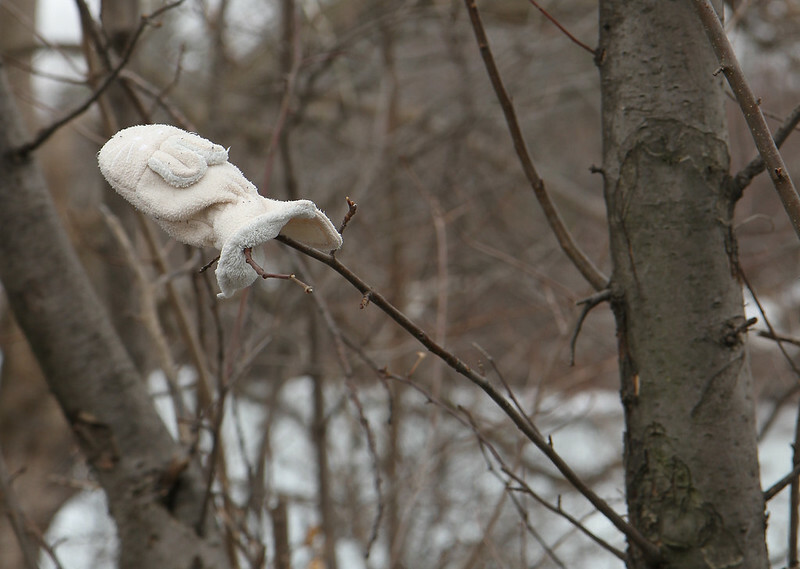 Out for a walk with my previous neighbour, Caroline in my old neighbourhood last March, I saw this fuzzy bunny mitten waiting patiently for its owner to find it. And this smile belongs to Caroline. 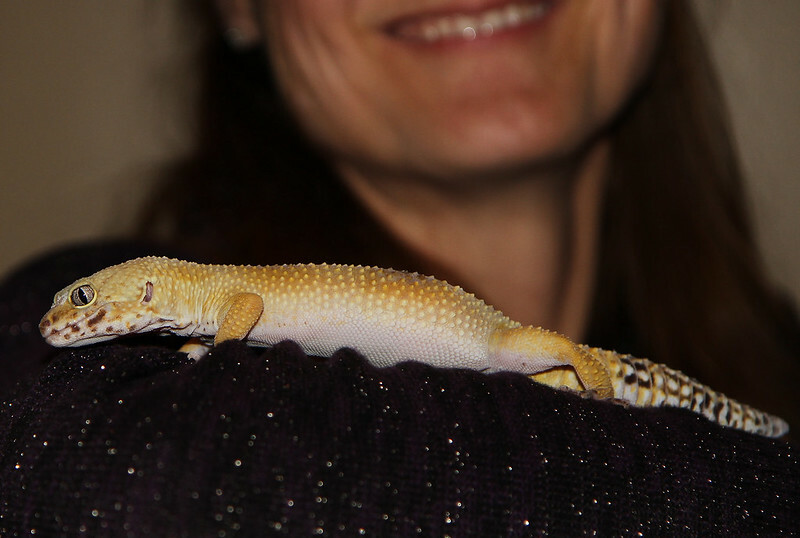 So does the cute and scaly little guy on her shoulder. I took an immediate liking to him... right from the gecko. 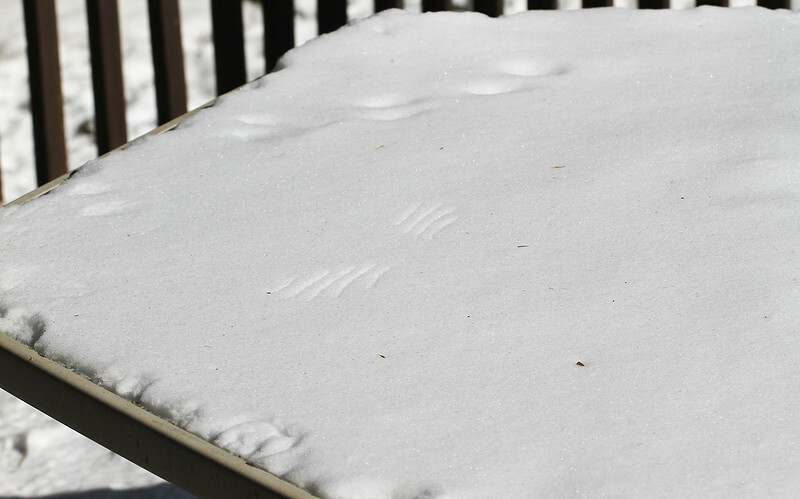 This delicate imprint in the snow appears to be from bird wings – most likely a blue jay. I suspect that it was about to land in the fresh snow but changed its mind in mid-descent. 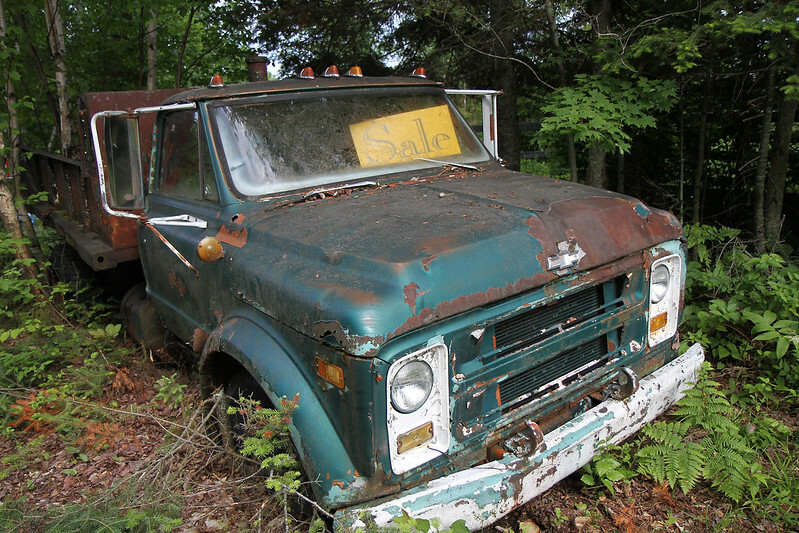 I wonder if anyone will buy this rusty old beauty and give it new life? These are Oliver's watchful eyes. He's about ten months old and belongs to my neighbour, Carol. I checked in on him a couple of times a day while she was away on holidays, recently. 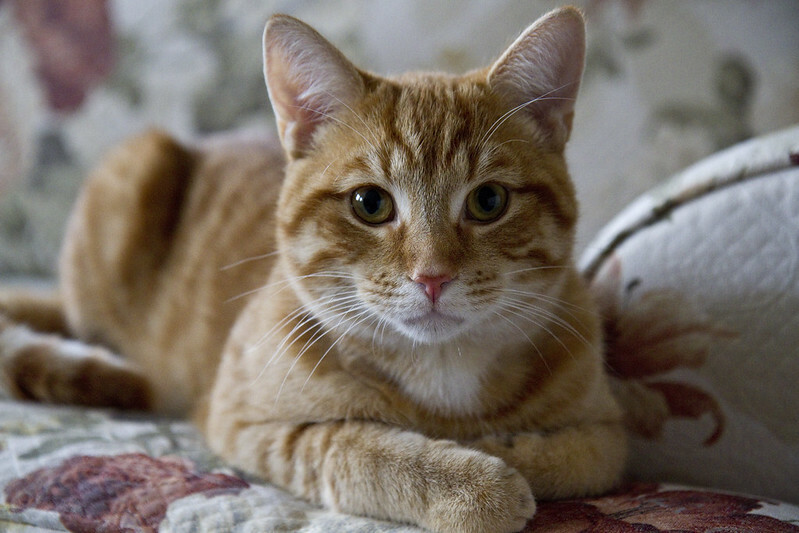 He's quite the cuddler, and never stops purring the full time that I'm with him – about a half hour each visit. I suppose that he continues to rumble for a while after I've closed the door behind me. 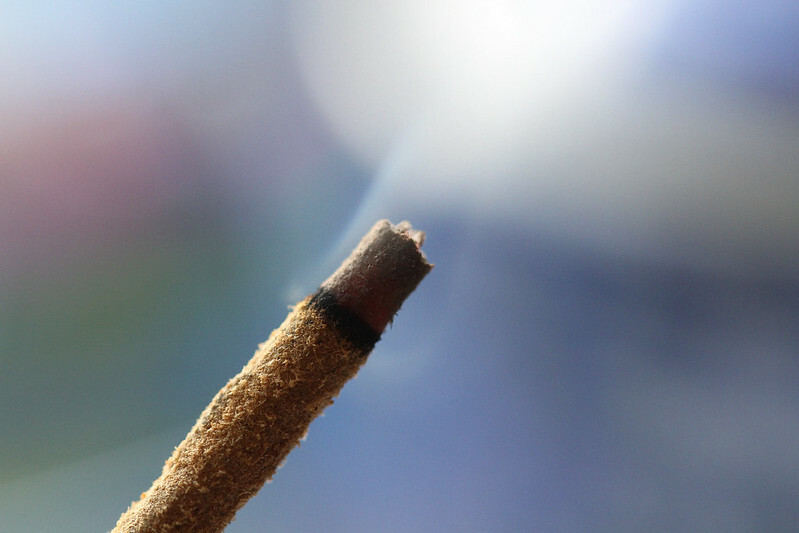 This last bit of texture is a macro view of a skinny stick of incense. The scent is called Super Hit, and it's one of my favourites. See you next time with more photos.